Want to perform on stage, in front of live audiences or on TV, and gain real industry experience? Are you ready to commit to dance classes, rehearsals and practising at home to help reach your goals? Contact us about joining Glow! Glow is our Junior-to-Intermediate performance troupe, open to dancers who demonstrate exceptional attitude, skills and commitment. 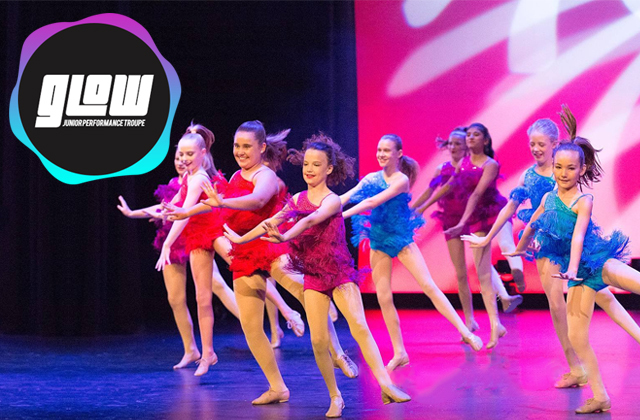 You will learn and rehearse choreography in a number of different styles in preparation for various fun and exciting performance opportunities WAPS offer throughout the year. This is perfect for those students wishing to gain more performance experience in the industry and further their career in the entertainment field! The WAPS Glow Troupe is open to dancers of all ages. Dancers should be committed, reliable and dedicated, and willing to participate in external performance opportunities. In order to join the Glow Troupe, members must take a minimum of one Ballet class and one Modern Jazz as well as one other dance class at WAPS. Troupe members are required to be committed and reliable team players, and as such we request that WAPS be notified in advance of any absences that affect attendance. The Glow Performance Troupe performs at a wide variety of events, both on television and live onstage. In the past our students have performed at public & community events (Fringe World Festival, Perth Royal Show, Subiaco Craft Fair, Bayview Terrace Festival, Wembley Downs District Fair, Disability Services Community Fair, Perth Christmas Lights Parade), televised events (Westcoast Fever Netball Flashmob event, regular appearances on Foxtel’s The Couch, Telethon, Channel 7 RAC Christmas Pageant, commercials), plus students may be given the opportunity to perform at private and corporate events as featured entertainers. The nature of these events requires performers to be punctual, rehearsed and professional representatives of WAPS. There may be extra transport and costume costs involved for students participating in external performances.